Entering the winter in the plains of Europe and America, the bikers would have to start thinking how to stay safe and fun riding on the track that has been filled with snow and ice. Well, Ducati provide the answer. 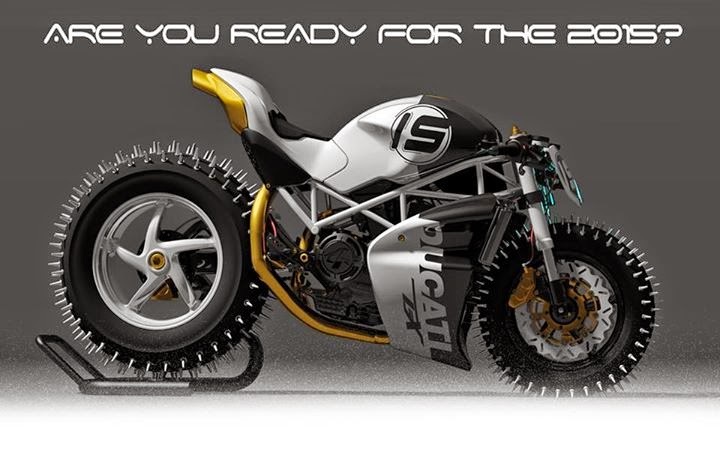 So, you will see the Ducati will be raced on the track ice though, by using Paolo Tesio's Ducati Monster, which has adapted the Ducati Monster is to become an expert on the snow and ice tracks, as quoted of Autoevolution on December 21, 2014. Ducati has put huge tires specifically for this Snow Monster. The diameter of the tire is made different between the front and rear that look more bigger. However, both have similarities, both attached by nails to increase traction on snow and ice. Rear tires are made huge and width is also not without reason. This is to support the traction on the ice track. Ducati also still rely on single arm innate, without replacing it with a double arm so that a stronger grip on the tires. Its looks also much more violent, by closing all the front engine. The tralis frame remains were left show the action. Aftermath is made higher than its big gas tank, as well as black-and-white livery with the number 15, which is a simple but impressive character of the every track motorcycle.